Located at the junction of Front Street and Queen Street in Hamilton city, the Birdcage is now a popular landmark in Bermuda. 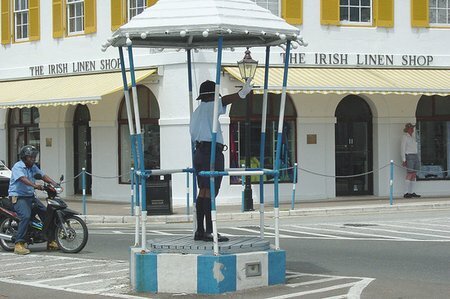 This blue and white metal structure was earlier used by the Bermuda police to regulate traffic at this junction. The traffic during the peak hours often came to halt due to heavy jams. But today, the Birdcage is more like a beloved icon and a tourist attraction. The traffic lights are now in use to regulate traffic here. But you will still at times see a policeman wearing Bermuda shorts posing for pictures to tourists. The cage has nothing to do with birds. It was named after Geoffrey 'Dickie' Bird who in the 1950s designed this cage. He was the first city engineer in Hamilton. Once when he was passing by this area, he noticed a policeman standing at the spot and controlling traffic. He realized that the policeman needed protection from the elements. That is when he designed the Bird Cage. Update April 2011: Geoffrey 'Dickie' Bird who designed the Bird Cage has passed away at the age of 89. He was instrumental in the construction of the City Hall and also introduced the concept of condominiums in Bermuda. He dedicated his life for development of the island, but he was best known for designing the Bird Cage which went on to become a great landmark in Hamilton City, and many tourists still take pictures of the structure. 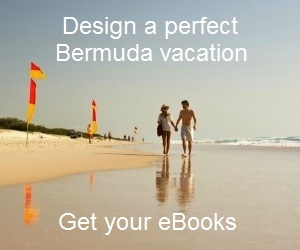 1) Check out Bermuda Tourist Map to view the location. 2) Check Pembroke Parish and Hamilton City for many other attractions in and around Hamilton Bermuda. I spent many happy hours in the Birdcage, especially during my first spell in Central Division '66-'69, and am saddened to see it virtually unused these days. I reckon that "The Bobby in the Birdcage" had to be one of the most photographed Policemen in the world! It used to be manned 0800-1800 every day except Sundays, but the installation of traffic lights on Front Street and Pitts Bay Road in the late '70s rendered its use unnecessary.